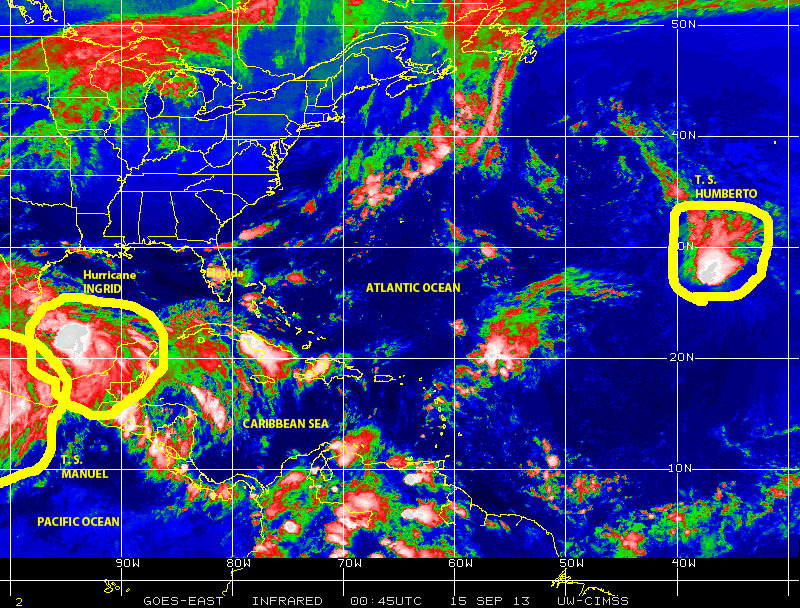 Two Hurricanes in three days! Today the 15th of September 2013 marks the 107th day of the 2013 Atlantic Hurricane Season, which until just 3 days ago had failed to generate a single hurricane and produced mostly nondescript tropical depressions and seven named tropical cyclones, all of the tropical storms. At the end of the day on Tuesday September 10, 2013 the current season was on the verge of tying the record for the longest elapsed hurricane season without a hurricane since we have been keeping records of this happenings. Then on September 11, on a date that lives in infamy for the USA, and just a few minutes off the record tropical storm Humberto to the west of the Cape Verde Islands became Hurricane Humberto the 8th named tropical cyclone and the first hurricane of the season. Hurricane Humberto tracked north and the NNW over the next day or so and soon encountered and adverse environment with much cooler sea surface waters and strong wind shear, which caused it to weaken to tropical storm strength. Early on 15 September Humberto was located some 1600 kilometers SW of the Azores Islands (Portugal), and was approaching warmer waters and a more favorable post-tropical atmospheric environment, which raised the possibility that it might again strengthen over the next 2 – 3 days. To emphasize the start of the historically most active phase of the Atlantic Hurricane season, based on historical records, barely three days later the second hurricane of the Atlantic season, Hurricane Ingrid, has been generated over the southwestern Gulf of Mexico in the evening of Saturday 14 September 2013. At the end of the day INGRID was tracking NNW, with maximum sustained winds of 140 kph, toward a projected landfall near Ciudad Madero and Tampico in the state of Tamaulipas on the east coast of Mexico. At the same time Mexico’s west coast was being hit by Tropical Storm Manuel, THE 13th named tropical cyclone of the eastern Pacific 2013 season, which officially started on 15 May 2013. Tropical Storm Manuel was hugging the Pacific coast line of Mexico northwest of Acapulco and appeared aiming for landfall late Saturday near Manzanillo. 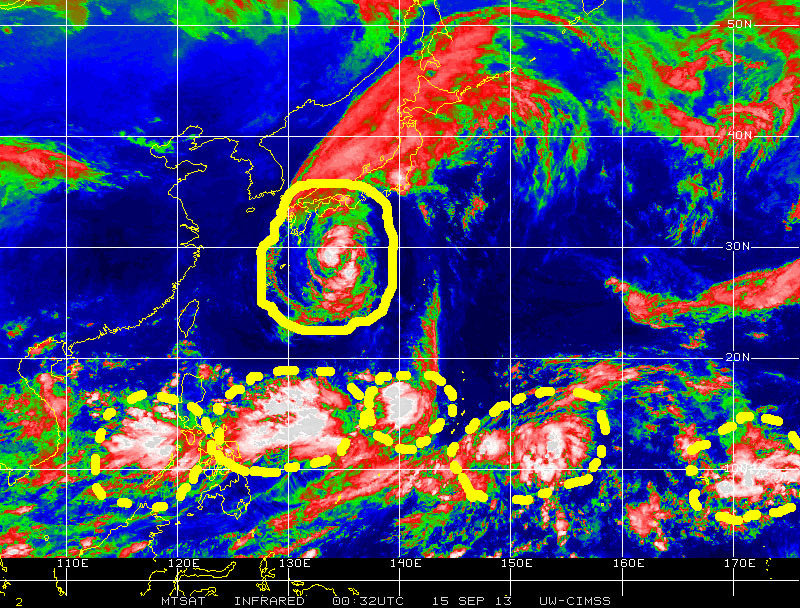 Besides Humberto, Ingrid and Manuel, a fourth named tropical cyclone, Tropical Storm Man-Yi, was moving over the Philippines Sea toward southeastern Japan. Just to the south, a train of tropical waves and large cells of disturbed weather extended more than 10,000 kilometers from the South China Sea to the west of the Philippines all the way to the Central Pacific south of Hawaii, and actually stretched to the west of the South China Sea another 5,000 kilometers to the Arabian Sea west of the Indian subcontinent. 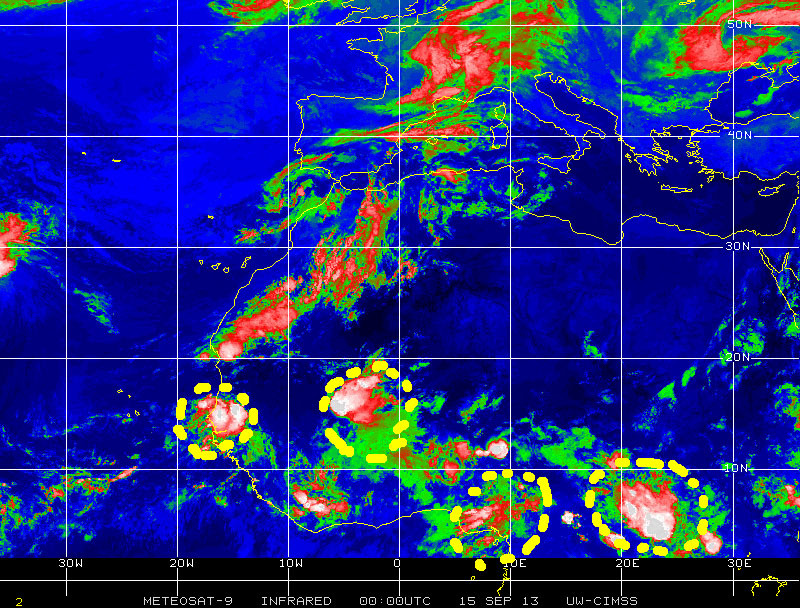 This is quite an impressive chain of disturbed weather cells located around 15 degrees north of the equator. On the opposite side of the Earth, over the far Eastern Atlantic and equatorial Africa, a few tropical waves populated the assembly line while moving west toward the warm waters of the Atlantic and Hurricane Alley. Because we have now entered what traditionally is the peak of the Atlantic season, interest in Caribbean, Central America, the Gulf, Florida and the Atlantic USA coast should monitor this signs of potential cyclonic activity over the larger basin, paying attention, remaining prepared for any future developments. Generating from a strong tropical wave emerging from Equatorial Africa over the Cape Verde Islands, Tropical Storm ERIN is now the 5th named tropical cyclone of the 2013 Atlantic Hurricane Season. As of this morning at 0500 EST ERIN was located at 16.3 N 30.5 W moving WNW at 25 kph with maximum sustained winds of 65 kph. Current guidance takes ERIN toward the open waters of the Atlantic and a somewhat adverse ocean-atmospheric environment. Currently it appears ERIN poses no threat to any landmass in the North Atlantic, but we still need to monitor the progress and development of this storm to see what may happen in the next several days. Following in ERIN’s footsteps there is a large and rather strong tropical wave over Equatorial Africa, which is about to emerge over the warm waters of the eastern Atlantic in the vicinity of the Cape Verde Islands, and which is the lead of a train of several other tropical waves or cells of disturbed weather traversing the African continent in a pattern that is typical for this time of the year. 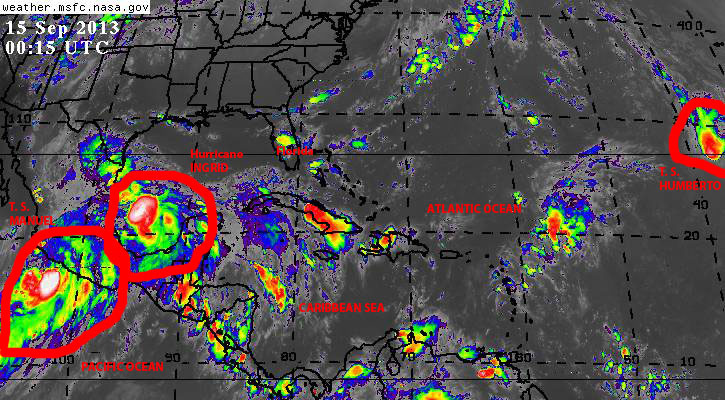 Closer to our neck-of-the-woods the disturbance that traversed the Yucatan Peninsula of Mexico from east to west on Thursday 15 August is now over the southern Gulf of Mexico moving WNW. 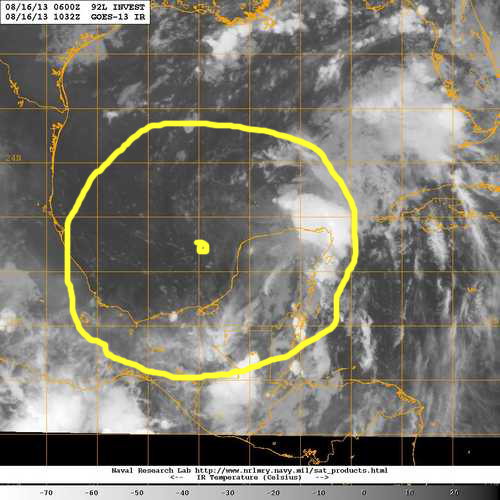 The system is somewhat disorganized at present, but it is still generating copious rains on its eastern extreme over the northeastern region of the Yucatan as far back as Cancun and Cozumel. Although the system still has some probability for re-strengthening as it approached a second landfall in Mexico, local conditions do not appear too favorable for further development at this time. 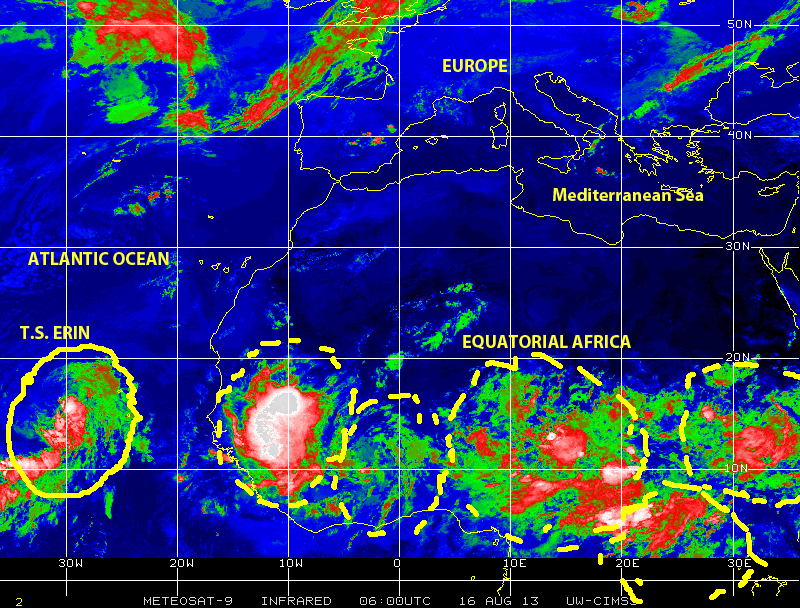 While we continue to monitor Tropical Storm ERIN and the disturbance in the Gulf of Mexico, our attention needs to be on Equatorial Africa and the eastern Atlantic to see what may become of the several tropical waves and storm cells now moving westward. Let us remain alert. Pay attention. Be prepared. MITIGATE!